There’s much to say about Georgia’s customs relating to food and hospitality, but to start, I wanted to post specifically about the Georgian national dish – khachapuri (ხაჭაპური – khač’ap’uri) or cheese bread. Everywhere my friend Susanne and I ate in Georgia, there was cheese bread – at restaurants, take out stands and at our home stay lodging experiences. We must have eaten cheese bread at least once a day, for 7 days straight! The cheese bread was “safe”. We usually ordered something exotic, not really knowing what it was and then split a cheese bread. Many variations of cheese bread exist, each specific to different regions in Georgia. Mostly we came across Imeretian. The best way I can describe Georgian cheese bread is to say it’s a combination of a white pizza slice and a mega toasty grilled cheese. It’s heavy and rich – in this respect like a Chicago deep dish. What interested me most was the cheese – it was like nothing I’ve ever tasted before. Suluguni is pungent, thick, salty and delicious. The taste is similar to a parmesan, but much more sharp, creamier and a bit sour. After much online research, I learned you can not buy this cheese in the states (total bummer). Some suggest using havarti and mozzarella to get a similar taste. 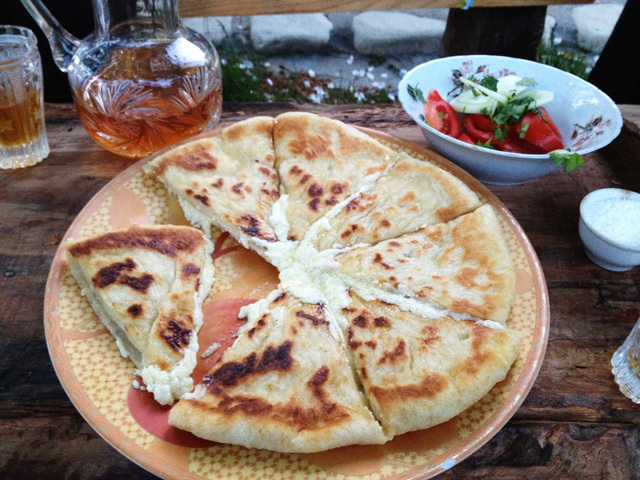 Khachapuri is filled with fresh or aged versions of sulugni. Each cheese bread we tried was a bit different. It was virtually impossible to discuss with the locals the specifics of the food we ate or wanted to order. We don’t speak or understand Georgian nor Russian and in the countryside English was rarely spoken. On all fronts, communication was a challenge to say the least! By far the best cheese bread we had was east of Tbilisi in Sighnaghi at Lali’s Guest House. When we arrived in the evening unannounced, Susanne and I were exhausted and starving. We were seated outside, around a beautiful handmade log table. Immediately we were given wine glasses and a craft of homemade wine was placed on the table. Wine in LARGE quantities is customary at every Georgian meal (yes, breakfast, lunch and dinner). 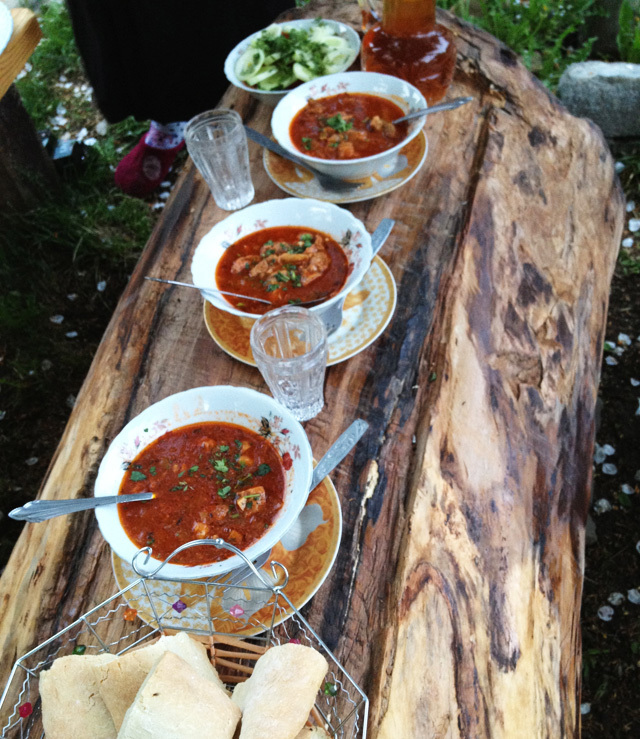 Within 30 minutes Lali presented us with hot meat stew, warm bread and fresh cucumber dill salad. Everything was perfect! Then came the cheese bread…. Lali brought the bread out steaming hot, straight from the oven. The khachapuri was unbelievably fresh, lightly crisped and the cheese was oozing out. It was seriously awesome! 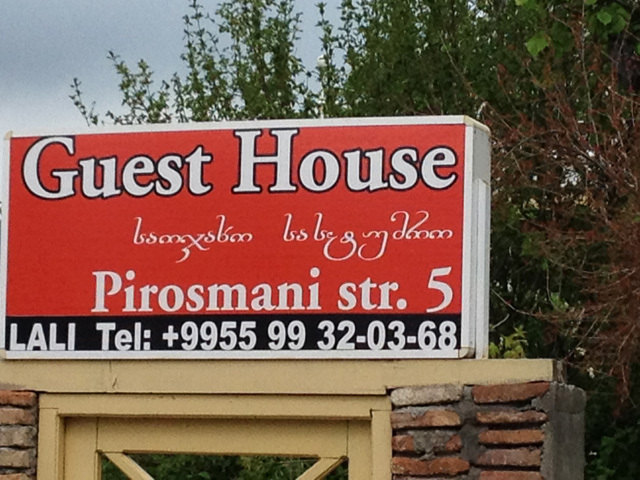 After a long day of sightseeing and travel, we felt lucky to have found Lali’s Guest House. She treated us like family and was generous in every way. If you visit the Republic of Georgia (which I highly recommend) you must make a stop in Sighnaghi and stay at Lali’s – feast on her delicious cheese bread and experience Georgian culture and hospitably at its best! !